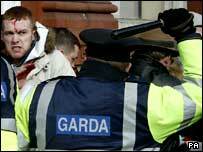 Several police officers and a journalist have been hurt during a republican riot in Dublin. Disturbances broke out in O'Connell Street in the city centre, where a unionist rally to remember the victims of republican violence was to start. Stones and fireworks were thrown after republican demonstrators mounted a counter-march. The loyalist rally was cancelled as a result of the trouble. Several cars were set on fire and up to 40 people have been arrested. It is understood a total of 14 people were injured, including six police officers who were taken to hospital for treatment. A number of protesters were also injured during the clashes. The demonstrators said they would "not allow a loyalist march to pass". Republicans threw missiles at police in riot gear. It is understood the counter-march was organised by Republican Sinn Fein - a political party which broke away from Sinn Fein in the 1980s. Sinn Fein maintained they were in no way involved in the violence. The loyalists who had intended parading along O'Connell Street staged a short rally outside Leinster House before returning north. One of the buses carrying them home was attacked by stone throwers as it approached the border town of Dundalk in County Louth. 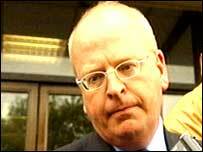 Ulster Unionist, Michael Copeland, who was on board, said the rioters had nothing to offer society. Irish Prime Minister Bertie Ahern said the unionists should have enjoyed the freedom to demonstrate their views. "There is absolutely no excuse for the disgraceful scenes in Dublin," he said. "It is the essence of Irish democracy and republicanism that people are allowed to express their views freely and in a peaceful manner. "People who wantonly attack gardai (police) and property have no respect for their fellow citizens." Up to 1,000 people had been expected to take part in the Love Ulster rally to remember those affected by republican violence. DUP and Ulster Unionist politicians were among those who had hoped to parade through the centre of the city, in a march organised by the victims group Fair. A delegation was to meet the Republic's Justice Minister, Michael McDowell after the march. Sinn Fein President Gerry Adams said the rioting was "entirely wrong and reprehensible". "There is no justification for what happened this afternoon in Dublin. Sinn Fein had appealed to people to ignore this loyalist parade and not to be provoked by it. "Our view was that it should not be opposed in any way and we made that clear. Regrettably a small, unrepresentative group, chose to ignore our appeal." Democratic Unionist MP Jeffrey Donaldson, who had been due to speak at the event, said: "We have received a warm welcome from ordinary Dubliners, but its clear these republicans have come from north of the border and other areas intent only on causing trouble. "They have done that and once again [republicans] through the threat of violence have denied unionists civil liberties." Ulster Unionist deputy leader Danny Kennedy and Fair director William Frazer handed a letter of complaint to Michael McDowell. Mr Kennedy said: "It's ironic that republicans are telling unionists that speaking rights are available to us in the Dail (Irish Parliament) and yet here we were denied speaking rights because of republicans. "They completely showed themselves for what they are." Mr McDowell said "acts of thuggery, brutality, cowardice and inhumanity" had been unleashed on the people of Dublin by "an organised mob". "The only message these people have managed to convey to the people of Dublin and of Ireland is that sectarian violence is, once again, being unleashed against all of the principles of the Good Friday Agreement and the overwhelming wishes of the Irish people." 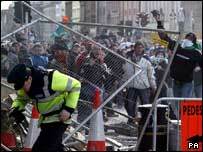 Irish President Mary McAleese said the rioting was "totally unacceptable". The SDLP's Alban Maginness strongly condemned the republican rioters. "It is disturbing that marchers have been prevented from peaceful demonstration," he said. "This action of extreme republicans simply plays into hands of those of the unionist right who cannot conceive unionist rights being upheld in a new Ireland."